Pomelo is big, delicious, nutritious and infinitely useful citrus fruit. It is the lord of the citrus fruits. Pomelo (Citrus grandis or Citrus maxima) is a citrus tree with the largest citrus fruit. Some varieties of pomelo can reach up to 10 kg. Originated from Asia and first that started to cultivate were the Chinese about 4000 years ago. Not accidentally it is called “Chinese grapefruit”. Today there are large plantations with this fruit in the U.S. and South America. In Asia it is preferred bitterer, sour and juicy pomelo and Europeans are creating new varieties that are sweeter, but not as juicy as the Asian. 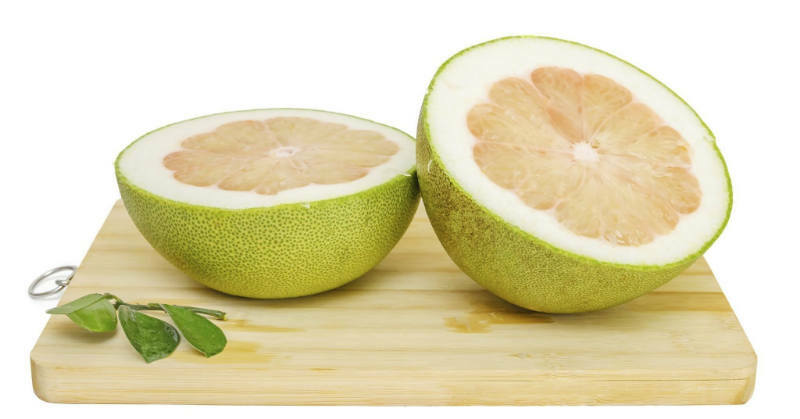 The “Europeanized” pomelo tastes like grapefruit, but is less bitter, and therefore is often referred to as “honey grapefruit”. It is super-rich in vitamin C, a valuable source of vitamin A, antioxidants, minerals (especially potassium), and essential oils. The taste qualities are unique, despite the similarities with grapefruit. It is a giant not only in size, but also is distinguished with the exceptional nutritional and health properties. Nutritional value in 100g: 36 calories, 0 g fat, 0.7 g protein, 9.1 g carbohydrates, 58 mg of vitamin C, 1 g fiber, 205 mg potassium, 1 mg sodium. Promotes Heart Health – Pomelo has a high content of potassium, which like Vitamin C plays an important role in supporting the heart. This essential mineral regulates blood pressure levels. Abundant in pectin, pomelo juice clears the arterial deposits accumulated in the body, thereby reducing the impurities and benefiting people with hypertension. Pomelo also reduces the cholesterol count in the body and promotes good cholesterol. Improves Digestion – Most fruits contain high amounts of fiber, and pomelos are no exception. One pomelo (the edible flesh only), contains about 25% of your daily requirement of fiber. This promotes healthy digestion and eliminates problems like constipation and diarrhea. High fiber content bulks up the stool, promotes smooth movement in the digestive tract, and stimulates the secretion of digestive and gastric juices to break down complex proteins and more difficult to digest foods. This keeps the digestive system functioning at a high level. Prevents Anemia – Research has shown that Vitamin C enhances the absorption of iron in body. Iron deficiency often leads to anemia i.e. shortage of blood in body. Having a diet rich in Vitamin C helps to combat iron loss and improves blood circulation. Promotes Bone Health – Potassium intake has been connected to bone mineral density, as it helps to facilitate the uptake of other essential minerals for keeping the bones strong. Therefore, pomelos can aid in preventing osteoporosis and general bone weakness throughout the body. Promotes Oral and Dental Health – Vitamin C is essential for producing collagen, which strengthens tissues, organs, and cells. This can boost the strength of your gums and oral surfaces to prevent them from becoming infected or weak, which can result in tooth loss and dangerous oral illnesses. Aids in Weight loss – The Pomelo fruit is just what you need to achieve weight loss. This is because it has a fat burning chemical which causes weight reduction. The fiber additionally stays in the stomach for long hence giving you a fullness feeling. This means you will have a tendency to eat less hence losing weight naturally. Pomelo is a low-calorie, without fat and cholesterol fruit. It is ideal ingredient in weight loss diets. Moreover it contains lipolytic ferment, which helps absorption and digestion of protein. This makes it a faithful assistant to those actively dealing with fitness and other sports. Heart Murmur Symptoms, Signs and Several Ways to Prevent It!